The first two generations of A3 were based on the Volkswagen Group A platform, which they share with the Audi TT, Volkswagen Golf, Volkswagen Caddy, and Volkswagen Touran, as well as SEAT León, SEAT Toledo, and Škoda Octavia. The third-generation A3 uses the Volkswagen Group MQB platform. The original A3 (or Typ 8L) was introduced in the European market in 1996, marking Audi's return to the production of smaller cars following the demise of the Audi 50 in 1978. This was the first Volkswagen Group model to use the "PQ34" or "A4" platform, bearing a close resemblance to the contemporary Volkswagen Golf Mk4, which arrived a year later. Within three years, this platform was used for total of seven cars. In 1999, Audi expanded the range with the introduction of more powerful versions: a 1.8 turbo rated 180 PS (132 kW; 178 hp), and a 1.9 TDI diesel engine with unit injector "Pumpe Düse" (PD) technology and variable geometry turbocharger. The four-wheel-drive A3 1.8T quattro used either the 150 PS (110 kW; 148 hp) or 180 PS (132 kW; 178 hp) engine, and the same Haldex Traction-based four-wheel-drive system as the Audi S3 and the Audi TT. Also in 1999, Audi also introduced a five-door body. Audi released the A3-derived Audi S3 in 1999, only as a three-door hatchback. The inline-four 20v 1.8 L turbocharged petrol engine came in two versions: 210 PS (154 kW; 207 hp) and 225 PS (165 kW; 222 hp). Early models (1999–2001) had 210 PS (154 kW; 207 hp). Later models (2001–2003) had variable valve timing and 225 PS (165 kW; 222 hp). The engine had a maximum of 280 N⋅m (210 ft⋅lbf) torque. This was the first time a small four-cylinder engine had been used in an Audi S-series car. Although dubbed "quattro", the S3 uses a different four-wheel drive system. The Haldex Traction coupling adjusts the bias of torque distribution from the front to rear axle as grip requirements change – most of the time it operates as a front-wheel drive. Standard features include xenon HID headlamps with high pressure washers and auto levelers, front fog lamps, 17" "Avus" alloy wheels with 225/45R17 tyres, electrically adjustable Recaro leather seats, climate control, alarm and electronic stability control with traction control. Options include a Bose sound system, boot/trunk or in-dash mounted 6-disc CD changer, metallic paint, 18-inch 9-spoke RSTT wheels, glass sunroof, centre arm rest, privacy glass (B-pillar backwards), auto-dimming rear-view mirror, parking assist, luggage net, heated front seats, cruise control, aluminium door mirror casings and part leather/Alcantara (blue/silver/yellow) combination seat coverings. These items are standard in some export markets. The engines used are the same as those for many other cars in the Volkswagen Group. At the 2003 Geneva Motor Show, Audi launched the second generation of the A3, the Typ 8P, designed by Gary Telaak during 2000 (however, the final design was frozen in 2001). Originally launched only as a three-door hatchback with four-cylinder engines, it featured a new automobile platform (the PQ35 platform), a redesigned and more spacious interior, new petrol engines with Fuel Stratified Injection (FSI), and standard six-speed manual gearboxes (except on the base 1.6). In mid-2003, the line was updated with two sports-oriented models, a 2.0 Turbo-FSI version rated 200 PS (147 kW; 197 hp), and a 3.2 L VR6 engine (for the first time) with 250 PS (184 kW; 247 hp). Haldex Traction-based quattro on-demand four-wheel drive, and the S-Tronic semi-auto gearbox were introduced as options (quattro is standard on the VR6) on models with engines over 140 PS (103 kW; 138 hp). The five-door "Sportback" model was introduced in June 2004. The A3 Sportback is 80 mm (3.1 in) longer than the base three-door body, and includes improved rear cabin space and a larger luggage compartment (370 litres). It also received the new "single frame" front grille originally introduced in the A8 W12, which was later adopted across the whole A3 range. In August 2006, Audi announced the second generation S3. Offered in three- and five-door body styles, the second generation—Typ 8P—S3 is powered by a modified and uprated Volkswagen Group-sourced 2.0-litre turbocharged FSI petrol engine, with a maximum output of 195 kW (265 PS; 261 bhp). As with all Audi S models, the design was done in-house by quattro GmbH. The engine features uprated high-performance pistons, revised boost/fuel mapping, increased turbocharger size (KKK K04) and larger intercooler. The most powerful form of this engine, and quattro four-wheel drive, makes for a 0–100 km/h (0–62 mph) time of 5.5 seconds, and an electronically limited top speed of 250 km/h (155 mph). Audi offers both six-speed manual and six-speed S-Tronic automatic transmissions with the S3. The spring ratings and dampers were revised, along with the body kit. Like its predecessor, although badged a "quattro" model, the S3 does not employ a Torsen centre differential (as in other common quattro models), but instead uses the Swedish Haldex Traction system in its on-demand four-wheel drive transmission, due to the transverse engine layout. Euro NCAP tested a second generation Audi A3 with front airbags, side airbags, seatbelt pretensioners and load limiters as standard. Despite Audi increasing the protection inside the car for the driver and passengers, pedestrian safety actually got 33% worse compared to the first generation and Euro NCAP gave criticism for the car offering virtually no protection at all on the front end and scoring just one star from a possible four. "A poor result for a new car" was the verdict given for pedestrian safety after the test. 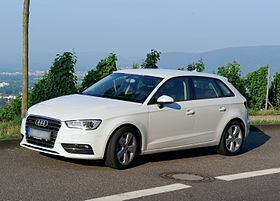 Audi introduced a number of changes to the A3 and S3 in 2008. These include revised nose and tail styling, with a modified grille and daytime running lights, common rail 2.0 TDI engines, seven-speed S tronic dual clutch transmission availability for the smaller non-U.S. engines, and optional "magnetic ride" adaptive shock absorbers. In addition, the range now includes an S3 Sportback model. Audi A3 TDI Clubsport quattro is a concept car unveiled in 2008. Based on the Audi A3 three-door, it is an approach by Audi to address both performance and the environment. The chassis has Audi's Magnetic Ride Suspension system, lowering the vehicle 1.4 inches (36 mm) from the base model. It also has ceramic front brakes, a four-link rear suspension and electro-mechanical servo assist for the rack and pinion steering. The Audi RS 3 is derivative of the A3 Sportback with a 5-cylinder, 2,480 cc (151 cu in) turbocharged engine rated at 340 PS (250 kW; 335 hp) and 450 N⋅m (332 lb⋅ft), vermicular-graphite cast iron crankcase, seven-speed S tronic transmission with two automatic modes and one manual mode, Quattro on-demand four-wheel drive system, widened track to 1,564 mm (61.57 in), MacPherson strut in aluminum, lowered body by 25 mm (0.98 in), 19-inch cast aluminum wheels in machine-polished titanium styling (optional black with a red rim flange) with 235/35 front and 225/35 rear tires, 370 mm (14.57 in) front and 310 mm (12.20 in) ventilated brake discs, aluminum brake disk covers, four-piston fixed calipers in high-gloss black with RS logos, electronic stabilization program with Sport mode, flared front fenders made of carbon-fiber-reinforced plastic (CFRP), prominent sill panels and exterior-mirror casings in matte aluminum, roof spoiler, high-gloss black diffuser insert, two elliptical exhaust tailpipes on the left, black interior, sports seats upholstered in Nappa leather with silver contrasting stitching, inlays in Piano black finish or Aluminum Race colour, flat-bottomed leather multifunction sports steering wheel, choice of 5 body colors are available with an unlimited selection of custom paint finishes. It's acceleration is quoted as 0 to 62 mph (0 to 100 km/h) in 4.6 seconds, with an electronically limited top speed of 155 mph (249 km/h). Optional features included front bucket seats, roof rails in matte aluminum look, styling packages in black or matte aluminum. In June 2009, Audi announced the release of two models of A3 1.6 TDI for European market. The first uses Audi's start/stop and energy recovery system, and will produce 105 PS (77 kW; 104 hp). This engine will achieve approximately 4.1 L/100 km (69 mpg‑imp; 57 mpg‑US). [clarification needed] The second engine does not use the same efficiency systems and will produce 90 PS (66 kW; 89 hp) will get 4.5 L/100 km (63 mpg‑imp; 52 mpg‑US). They went on sale in June 2009. 2. As of April 2010, Audi has yet to release official specifications or prices for the 1.2 TSI model, as the 1.6 model has been made a special clearance model for clearing out 1.6 stock. The A3 2.0 TDI clean diesel is a version of Audi's A3 2.0 TDI for the North American market, making it the second Audi TDI vehicle sold in North America, following the Audi Q7 TDI in 2008. It is a FWD vehicle with S-tronic transmission with Hill-hold assist, Sirius satellite radio, Leather seats and steering wheel, Auxiliary audio input, Dual-zone climate control, 17 in (432 mm) alloy wheels. The vehicle was unveiled at the 2009 North American International Auto Show. This US model would begin sale in the first quarter of 2010 as a 2010 model year vehicle. The 2012 Audi 2.0L I4 TDI produces 140 hp (104 kW) and 236 lb⋅ft (320 N⋅m) of torque and will go from 0 to 60 mph (0 to 97 km/h) in 8.9 seconds. The vehicle was unveiled at the 2012 Geneva Motor Show and went on sale in Europe in September 2012. First vehicle using the flexible modular Volkswagen Group MQB platform, the third generation is available as a three-door hatchback, a five-door "Sportback", a four-door saloon to directly rival the Mercedes-Benz CLA-Class, and a two-door Cabriolet. The front suspension is a MacPherson strut set-up while the rear utilizes multi-link rear suspension. The vehicle was unveiled at the 2013 New York Auto Show. The Audi A3 Sportback includes a wheelbase 58 mm (2.28 in) over previous model, 35 mm (1.38 in) longer than that of the A3 and a front axle shifted forward by 40 mm (1.57 in) over the previous model. Other features include a choice of 13 body colours (three solid finishes, eight metallic finishes and two pearl-effect finishes), optional high-gloss package adding accents around the windows (standard with the Ambiente trim line), six-speed manual transmission (optional S tronic) for all engine models, 16 or 17-inch wheels depending on trim line (optional 18-inch wheels), Audi drive select (standard with Ambition) with optional S tronic, and optional electromagnetic damper control system. It is a version of the A3 Sportback with 1.4 TFSI (110 PS) engine powered by compressed natural gas or Audi e-gas synthetic methane; gas tank made of gas-impermeable polyamide polymer, carbon fiber reinforced polymer (CFRP), glass fiber reinforced polymer; and an electronic gas pressure regulator. The synthetic methane was produced by waste product from a nearby Werlte biogas plant operated by power utility EWE. The plug-in hybrid concept car was unveiled at the 2013 Geneva Motor Show. In May 2013 Audi confirmed its decision to produce a plug-in hybrid version of the A3, the Audi A3 Sportback e-tron, which was scheduled for retail sales in Europe by late 2013, and by mid 2014 in the U.S. and the UK. The A3 e-tron shares the same plug-in hybrid powertrain used in both the Volkswagen Golf GTE and Passat GTE.To charge the A3 e-tron, the Audi four rings logo is pulled along to reveal a charging socket. The A3 Sportback e-tron is powered by a 1.4 L TSI gasoline engine that delivers 148 bhp (110 kW) and 184 lb⋅ft (249 N⋅m) of torque, coupled with a 101 bhp (75 kW) electric motor, which is integrated into the car's six-speed dual-clutch automatic transmission, for a total combined output of 201 bhp (150 kW) and 243 lb⋅ft (329 N⋅m) The plug-in hybrid has an 8.8 kWh battery pack that delivers an all-electric range of 50 km (31 mi) on the NEDC cycle, and a total of 940 km (584 mi). The plug-in hybrid can reach a top speed of 220 km/h (137 mph) and can accelerate from 0-100 km/h (62 mph) in 7.6 seconds. According to Audi the car has an average fuel efficiency of 188 mpg equivalent and CO2 emissions of 35 g/km. In September 2013, at the Frankfurt Motor Show, Audi announced the Audi A3 Sportback e-tron would be available in Europe in the second quarter of 2014 at a price of €37,000 Euros (US$45,500, GB£30,500), but it slipped to orders in the second quarter of 2014, with deliveries slated for the third quarter. On August 1, 2014, Audi announced the A3 Sportback e-Tron was on sale across Europe. The first 227 units were registered in Germany in August 2014. As of December 2015[update], global sales totaled 12,994 units, of which, 12,945 units were registered in Europe, and 49 units in the United States, where deliveries began in December 2015. The third generation Audi S3 is powered by a 2.0 L; 121.1 cu in (1,984 cc) TFSI (turbo gasoline direct injection) inline-four engine, with an output of 221 kW (300 PS; 296 bhp) at 5,500 rpm and 380 N⋅m (280 lbf⋅ft) of torque at 1,800-5,500 rpm, with its redline at 6,800 rpm. It features new pistons with stronger bolts and new rings, as well as reinforced connecting rods with new mounts transferring the power to the crankshaft. The cylinder head is made of a new lightweight aluminium alloy designed with high strength and temperature resistance in mind. It has a combined fuel economy of 23 mpg‑US (10 L/100 km; 28 mpg‑imp) manual; and 24 mpg‑US (9.8 L/100 km; 29 mpg‑imp) with S tronic. Details for the RS 3 Sportback were revealed in December 2014. It went on sale in the first quarter of 2015 and featured a 2.5 litres (2,480 cc) straight-5 engine with 367 PS (270 kW; 362 hp) and 465 N⋅m (343 lbf⋅ft) of torque. The RS 3 Sportback had a seven speed S tronic transmission and quattro all-wheel drive system which helped propel the car to 100 km/h (62 mph) in 4.3 seconds. The RS 3 Sportback out-performs the BMW M2 & Mercedes-Benz A45 AMG in a straight line, thanks to Audi's quattro feature. Scott Keogh of Audi of America said in April 2015 that he's "confident" we'll see the car come to the United States. An Audi RS3 LMS TCR in the ADAC TCR Germany Touring Car Championship paddock. An Audi RS3 LMS TCR in the TCR Europe Series paddock. Robb Holland used an S3 Saloon to compete in the 2014 British Touring Car Championship season under the NGTC regs. Currently AmD Tuning field two S3 Saloon's for Ant Whorton-Eales and Ollie Jackson. In 2016, Audi's motorsports brand, Audi Sport announced that it would be producing a RS3 LMS beginning in 2017. The car is built to TCR International Series regulations. ^ "Bentley Motors Website : World of Bentley : Exhibitions : 'An Unbroken Line' Exhibition : The Team". Bentleymotors.com. Retrieved 21 February 2013. ^ "Dirk van Braeckel". Businessweek. 29 May 2005. Retrieved 21 February 2013. ^ a b c "Euro NCAP results for Audi A3, 3dr hatchback". euroncap.com. 1998. ^ "Audi S3". carautoportal.com. Archived from the original on 31 July 2009. Retrieved 28 June 2009. ^ "Audi UK – production info". Audi.co.uk. Archived from the original on 11 October 2009. Retrieved 9 October 2010. ^ "Profiles – Telaak's Challenge: Redesigning an Automotive Icon – 08/06". 66.192.79.249. Archived from the original on 16 October 2013. Retrieved 21 February 2013. ^ "2006 Audi A3 First Drive". Autobytel.com. 17 May 2005. Retrieved 21 February 2013. ^ "The new generation Audi A3". www.audi.co.uk. 27 April 2008. Archived from the original on 12 May 2008. Retrieved 14 July 2008. ^ Monticello, Mike (August 2008). "Audi A3 TDI Clubsport Quattro Concept". Road & Track: 20. Archived from the original on 24 February 2011. ^ "Premium Audi Channel : Audi RS 3 Review". AudiChannel. Archived from the original on 5 October 2014. ^ "Big performance in a small package: the Audi RS 3 Sportback". www.audi.com. Audi. 22 November 2010. Archived from the original on 5 March 2012. Retrieved 25 November 2010. ^ "Audi A3 Cabriolet prepares for its grand finale < Latest news < About Audi < Audi". Audi UK. Archived from the original on 10 June 2013. ^ "engines added to the Audi A3 range". www.audi.com. 2 June 2009. ^ "Dynamics and Efficiency: Three New Models at the IAA". www.audi.co.uk. Audi UK. 28 August 2009. Archived from the original on 19 May 2011. Retrieved 26 April 2010. ^ Abuelsamid, Sam (19 January 2009). "Detroit 2009: A3 TDI coming to US Audi dealers late this year". Green.autoblog.com. Retrieved 9 October 2010. ^ "Audi A3 2.0TDI". Audiusa.com. ^ a b "Official Audi A3 125 kW TDI Data Sheet" (PDF). ^ "Audi A3 TDI FAQ and reviews". ^ "Audi starts production in Brazil". www.audiusa.com. Retrieved 25 November 2018. ^ a b c "A Key for Higher Margins – The Modular Toolkit Strategy" (PDF). volkswagenag.com. 19 May 2011. Archived (PDF) from the original on 2 July 2011. Retrieved 25 May 2011. ^ a b c d "Audi Deutschland – New A3 – Dimensions". Audi.de. Archived from the original on 12 March 2012. Retrieved 24 March 2012. ^ "Audi A3 KCurb Weight". carleasingmadesimple.com. Archived from the original on 24 September 2013. ^ a b "2015 Audi RS 3 Sportback revealed". AUSmotive.com. 2014-12-12. Retrieved 2014-12-12. ^ Ramsey, Jonathon. "2013 Audi A3 is Ingolstadt's new baby". Autoblog. Retrieved 16 March 2015. ^ "Geneva motor show: Audi A3". Autocar. 6 March 2012. Retrieved 24 March 2012. ^ Bickerstaffe, Simon (19 July 2012). "Conti puts the brakes on secondary collisions". Ae-plus.com. Archived from the original on 7 June 2015. Retrieved 30 June 2015. ^ "Petrol or diesel? New 57mpg Audi A3 TFSI makes the decision even harder < Latest news < About Audi < Audi". Audi UK (Press release). Archived from the original on 2 March 2013. ^ "New super-frugal Audi A1 and a3 'CoD' models make the cut" (Press release). Audi UK. 11 March 2013. Archived from the original on 28 January 2015. Retrieved 30 June 2015. ^ Miersma, Seyth. "2014 Audi A3 Sedan makes its world debut in NYC [UPDATE]". Autoblog. ^ Audi Communication (24 January 2015). "Audi MediaServices - The Audi A3 Sedan –". audi-mediaservices.com (Press release). ^ "Audi A3 and S3 saloons strike out in a new direction". Audi UK (Press release). Archived from the original on 1 April 2013. ^ "Security Check Required". www.facebook.com. Retrieved 2017-08-11. ^ Audi Communication (24 January 2015). "The new Audi A3 Sportback g-tron". audi-mediaservices.com (Press release). Archived from the original on 19 June 2013. ^ Zach Bowman (5 March 2013). "Audi A3 E-Tron is a look at battery-operated things to come". Autoblog.com. Retrieved 2 June 2013. ^ a b Lewis Kingston (31 May 2013). "Audi A3 Sportback e-tron plug-in hybrid to arrive in 2014". Autocar. Retrieved 2 June 2013. ^ a b Jay Cole (31 May 2013). "Audi Says A3 Sportback e-tron Goes Into Production And On Sale THIS Year". InsideEVs.com. Retrieved 2 June 2013. ^ "Audi logo History Evolution". thecarbrands.com. 26 October 2016. Archived from the original on 26 October 2016. Retrieved 26 October 2016. ^ Mike Millikin (2014-09-29). "Promised VW Passat plug-in hybrid to debut at Paris show; both sedan and wagon". Green Car Congress. Retrieved 2014-09-29. ^ Mike Szostech. "Audi A3 E-tron gets priced for Germany at 37,000 Euros". My Electric Car Forums. ^ Mike Szostech. "Audi A3 e-Tron Availability". MyAudiA3eTron.com. My Electric Car Forums. Retrieved 1 August 2014. ^ Mark Kane (2014-09-24). "Germany Plug-In Electric Vehicle Sales Report August 2014". InsideEVs.com. Retrieved 2014-09-29. ^ Gibbs, Nick (2016-03-15). "Hybrid sales expected to triple in Europe as tougher CO2 rules loom". Automotive News Europe. Retrieved 2016-02-22. European Audi A3 e-tron sales totaled 1,154 units in 2014 and 11,791 in 2015. Sale figures as reported by JATO Dynamics. ^ Voelckr, John (2016-01-19). "Plug-In Electric Car Sales For 2015 Fall Slightly From 2014". Green Car Reports. Retrieved 2016-02-13. A total of 49 Audi A3 e-trons were sold in the U.S. in 2015. ^ "2012 Audi S3". Carfolio.com. 2013-07-17. Retrieved 2018-08-01. ^ "2013 Audi S3 Hatchback". Car and Driver. Retrieved 2018-11-05. ^ Bruce, Chris (7 April 2015). "Audi Plans RS 3 for US". Autoblog. Retrieved 30 June 2015. ^ "Audi: RS 3 "Birth"". Daily Commercials. 17 May 2015. Retrieved 15 May 2015. ^ a b "Audi A3 and S3 Pricing and specification guide - Engine Specifications" (PDF). Audi UK. 2014. p. 82. Retrieved 16 March 2015. ^ a b "A3 Sportback S3 Sportback A3 Sportback e-tron Pricelist" (PDF). Audi UK. 2017. p. 45. Retrieved 2018-02-21. ^ "2013 COTY: Audi A3". What Car?. 9 January 2013. Archived from the original on 13 January 2013. Retrieved 9 January 2013. 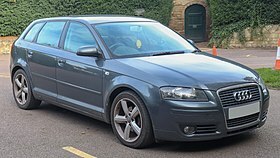 Wikimedia Commons has media related to Audi A3.